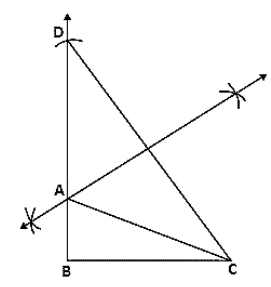 Construct a △ABC in which BC = 3.6 cm, AB + AC = 4.8 cm and ∠B = 60°. 1. Construct a line segment BC of 3.6 cm. 2. At the point B, draw ∠XBC = 60°. 3. Keeping B as center and radius 4.8cm draw an arc which intersects XB at D.
5. Draw the perpendicular bisector of DC which intersects DB at A. Hence △ABC is the required triangle. 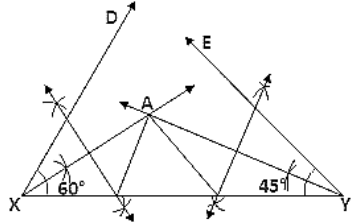 Construct a △ABC in which AB + AC = 5.6 cm, BC = 4.5 cm and ∠B = 45°. 1. Construct a line segment BC of 4.5 cm. 2. At the point B, draw ∠XBC = 45°. 3. Keeping B as centre and radius 5.6cm draw an arc which intersects XB at D.
Construct a △ABC in which BC = 3.4 cm, AB - AC = 1.5 cm and ∠B = 45°. 1. Construct a line segment BC of 3.4 cm. 3. Keeping B as centre and radius 1.5cm draw an arc which intersects XB at D.
Using rulers and compasses only, construct a △ABC, given base BC = 7 cm, ∠ABC = 60°,  AB + AC = 12 cm. 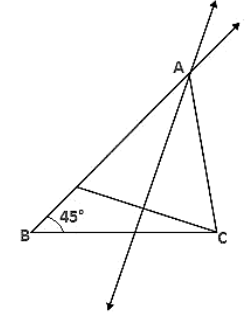 Construct a triangle whose perimeter is 6.4 cm, and angles at the base are 60° & 45°. 1. Draw a line segment XY of 6.4 cm. 2. Draw ∠DXY = 60° and ∠EYX = 45°. 3. Draw the angle bisectors of ∠DXY and ∠EYX which intersect each other at A. 4. Draw the perpendicular bisector of AX and AY which intersect XY at B and C respectively. 5. Join AB and AC. 1. 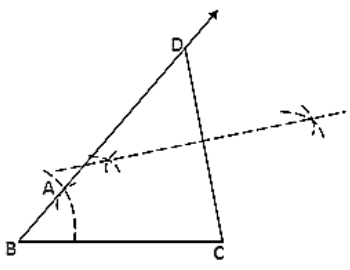 Draw a line segment XY of 12 cm. 2. Draw ∠DXY = 45° and ∠EYX = 60°. 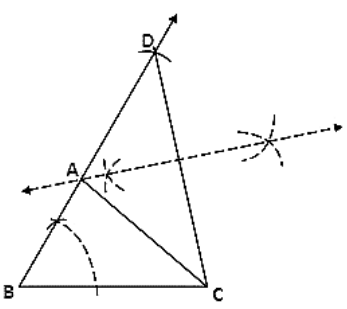 Construct a right-angled triangle whose perimeter is equal to 10 cm and one acute angle equal to 60°. 1. Draw a line segment XY of 10 cm. 2. Draw ∠DXY = 90° and ∠EYX = 60°. 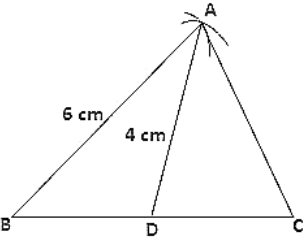 Construct a triangle ABC such that BC = 6 cm, AB = 6 cm and median AD = 4 cm. 1. 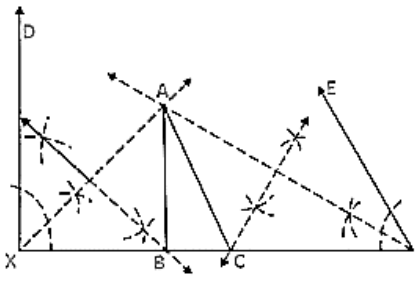 Draw a line segment BC of 6 cm. 2. Take mid-point O of side BC. 3. With center B and D and radii 6cm and 4cm, draw two arcs which intersect each other at A. 4. Join AB, AD and AC. 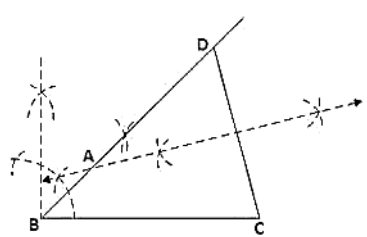 Construct a right-angled triangle ABC whose base BC is 6 cm and the sum of the hypotenuse AC and other side AB is 10 cm. 1. Construct a line segment BC of 6 cm. 2. At the point B, draw ∠XBC = 90°. 3. Keeping B as center and radius 10cm draw an arc which intersects XB at D.
Construct a triangle XYZ in which ∠Y = 30°, ∠Z = 90° and XY + YZ + ZX = 11 cm. 1. 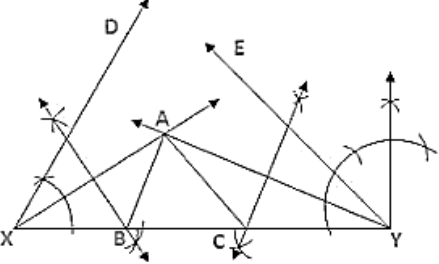 Draw a line segment AB of 11 cm. 2. Draw ∠DAB = 30° and ∠FBA = 90°. 3. Draw the angle bisectors of ∠DAB and ∠EBA which intersect each other at X. 5. Join XY and XZ. Hence △XYZ is the required triangle.